This article discusses the foundational code construct called Domain Primitive. Domain Primitives are the smallest building block in your domain model, and a key concept to understand for creating code that is Secure by Design. Some of the key properties of a value object in Domain-Driven Design are that it’s immutable, it forms a conceptual whole, and it can uphold invariants and check constraints. We have found that if you take the concept of the value object and slightly tweak it, while having security in mind, you get something called a domain primitive. The blog posts have been sparse but I've still been writing a lot lately. After years of thoughts, discussions, and trying out ideas in real projects, we decided to formalize our views on software security in the form of a book. A privilege to write a book together with such great co-authors as Dan Bergh-Johnsson and Daniel Deogun. 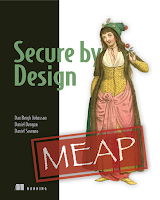 Today is a big day because the first early drafts of the book is now released to the public through the Manning ”early access program” (MEAP). We still have a long way to go, and a lot of hard work ahead of us, but I'm confident it'll turn out just as good as we hope - or better.